The most striking issue in 2008/2009 was the financial and economic crisis with its worldwide consequences, affecting both advanced economies and emerging countries. The period was also marked by the confirmation of several ongoing trends, such as the political and economic rise of China, the resurgence of Russia on the international scene and the limited growth of Western economies. By contrast, the election of Barack Obama as the 44th American President unleashed new expectations about U.S. international policies. Finally, central transnational problems, such as climate change, the energy crisis or terrorism, remained at the top of policy agendas. In the following sections, global challenges and their respective global responses will be considered and analysed for their impact on space activities and space policies. A particular focus will be put on Europe. “Declaration Summit on Financial Markets and the World Economy.” 15 Nov. 2008. G20. 31 July 2009. http://www.g20.org/Documents/g20_summit_declaration.pdf. “Statement of G7 Finance Ministers and Central Bank Governors.” 14 Feb. 2009. G8 Information Centre. 31 July 2009. http://www.g7.utoronto.ca/finance/fm090214.pdf. “The Global Plan for Recovery and Reform.” 2 Apr. 2009. G20. 31 July 2009. http://www.g20.org/Documents/final-communique.pdf. “Declaration on Alliance Security Issued by the Heads of State and Government Participating in the Meeting of the North Atlantic Council in Strasbourg/Kehl on 4 April 2009.” 4 Apr. 2009. NATO Press Release (2009)043. 31 July 2009. http://www.nato.int/cps/en/natolive/news_52838.htm?mode=pressrelease. IPCC website. 3 Aug. 2009. http://www.ipcc.ch. UNFCC website. 3 Aug. 2009. http://unfccc.int. “The Global Plan for Recovery and Reform.” 2 Apr. 2009. G20.31 July 2009. http://www.g20.org/Documents/final-communique.pdf. “International Energy Agency.” 2008. OECD/IEA. 3 Aug. 2009. http://www.iea.org/about/docs/iea2008.pdf. “Commission Demands New Power in Gas Crisis.” 18 June 2009. Euractiv.com. 3 Aug. 2009. http://www.euractiv.com/en/energy/commission-demands-new-powers-gas-crises/article-183290. “Towards a Sustainable Energy Future. IEA Programme of Work on Climate Change, Clean Energy and Sustainable Development.” 2008. OECD/IEA. 3 Aug. 2009. http://www.iea.org/G8/2008/G8_Towards_Sustainable_Future.pdf. “Agricultural outlook 2009–2018.” 2009. OECD/FAO. 4 Aug. 2009. http://www.oecd.org/dataoecd/2/31/43040036.pdf. “G8 Leaders Statement on Global Food Security.” 9 July 2008. Ministry of Foreign Affairs of Japan. 4 Aug. 2009. http://www.mofa.go.jp/POLICY/economy/summit/2008/doc/doc080709_04_en.html. “Agriculture and Food Security at the Core of the International Agenda.” 10 Apr. 2009. Agriculture G8 Final Declaration. 4 Aug. 2009. http://www.g8agricultureministersmeeting.mipaaf.com/en/index.php?pL1=news&newsId=8895ca36c193f25a5c2a63beb291a259&page=1. “Statistics: Graphs & Maps.” 2009. UNEP. 4 Aug. 2009. http://www.unwater.org/statistics.html. “The 2008 Zaragoza Charter.” 14 Sept. 2008. 2008 Zaragoza International Exhibition. 4 Aug. 2009. http://www.expozaragoza2008.es/docs/repositorio/TribunaDeAgua/docs_pdf/cartazgz-en.pdf. “Water for a sustainable Europe — our vision for 2030.” 30 June 2008. European Water Partnership. 4 Aug. 2009. http://www.ewp.eu/wp-content/uploads/2009/03/water-vision-for-europe.pdf. “International Shipping and World Trade. Facts and Figures.” Nov. 2008. International Maritime Organisation. Maritime Knowledge Center. 4 Aug. 2009. http://www.imo.org/includes/blastDataOnly.asp/data_id%3D23754/InternationalShippingandWorldTrade-factsandfigures.pdf. “ACI Global Traffic Forecast Report 2008–2027”. 10 Sept. 2008. International Civil Aviation Organisation. 4 Aug. 2009. http://www.icao.int/ceans/Docs/Ceans_Wp_066_en.pdf. Eurostat Statistics. 5 Aug. 2009. http://epp.eurostat.ec.europa.eu/portal/page/portal/science_technology_innovation/data/main_tables. “United Nations Programme on Space Applications Activities Schedule.” 2009. United Nations Office for Outer Space Affairs. 6 Aug. 2009. http://www.oosa.unvienna.org/oosa/en/SAP/sched/index.html. UNESCO website. 6 Aug. 2009. http://portal.unesco.org/en/. UNGIWG website. 6 Aug. 2009. http://www.ungiwg.org/unsdi.htm. ITU website. 6 Aug. 2009. http://www.itu.int/net/home/index.aspx. UNIDIR website. 6 Aug. 2009. http://www.unidir.org/html/en/home.html. “CD Report2009.” 2009. Reaching Critical Will. 6 Aug. 2009. http://www.reachingcriticalwill.org/ political/cd/speeches09/reports.html. Group on Earth Observations website. 6 Aug. 2009. http://earthobservations.org/index.html. UNOOSA website. 6 Aug. 2009. http://www.unoosa.org/. “Asia-Pacific Space Cooperation Organization Starts Operation.” 16 Dec. 2008. www.chinaview.cn.6Aug.2009.http://news.xinhuanet.com/english/2008-12/16/content_10514901.htm. APRSAF website. 6 Aug. 2009. http://www.aprsaf.org/. “Department of Trade and Industry (DTI) Minister Mandisi Mpahlwa, launch of the South African National Space Policy.” 6 Mar. 2009. South African Government Information. 6 Aug. 2009. http://www.search.gov.za/info/previewDocument.jsp; Mostert, S. “The African Resource Management (ARM) Satellite Constellation.” African Skies/Cieux Africains 12 (2008): 53-56. “Ministers Meet to Define the Role of Space in Delivering Europe’s Global Objectives.” 18 Nov. 2008. European Space Agency. 11 Aug. 2009. http://www.esa.int/esaCP/SEMUPQ4DHNF_index_2.html. Bigot, Bernard/ d’Escatha, Yannick and Laurent Collet-Billon. “L’Enjeu d’une Politique Européenne de Lanceurs: Assurer Durablement à 1’Europe un Accès Autonome à l’Espace.” 18 May 2008. 11 Aug. 2009. http://lesrapports.ladocumentationfrancaise.fr/BRP/094000223/0000.pdf. ESA website. 11 Aug. 2009. http://www.esa.int/. “Réunion Informelle des Ministres Européens Chargés de l’Espace à Kourou: Communiqué Final. 22 July 2008. Ministère de l’Enseignement Supérieur et de la Recherche. 12 Aug. 2009. http://www.enseignementsup-recherche.gouv.fr/cid21740/reunion-informelle-des-ministres-europeens-charges-de-l-espace-a-kourou-communique-final.html. “Critical Space Technologies for European Strategic Non-Dependance.” 19 Sept. 2008. European Space Agency. 12 Aug. 2009. http://www.congrex.nl/08C37/. “Galileo Global Nav System Examined by European Court of Auditors.” 1 July 2009. Satnews.com. 12 Aug. 2009. http://www.satnews.com/cgi-bin/story.cgi?number=1653440132. “Declaration on Strengthening Capabilities.” 11 Dec. 2008. Council of the European Union. 12 Aug. 2009. http://www.consilium.europa.eu/uedocs/cms_data/docs/pressdata/en/esdp/104676.pdf. WEU Assembly website. 13 Aug. 2009. http://www.assembly-weu.org/. “Conclusions Xth European Interparliamentary Space Conference.” 14 Oct. 2008. EISC. 13 Aug. 2009 http://www.eisc-europa.eu/images/stories/documents/10theisc.pdf. Bénéteau, Alain/Laporterie-Déjean, Florence/Baron, Hélène and Christine Guidice. NEREUS. “Network of European Regions Using Space Technologies.” Presentation. Eurisy. Dublin, Ireland. 20-21 May 2008; “Le Bulletin de Spheris N.36.” March 2009. Spheris. 13 Aug. 2009. http://www.spheris-fr.com/Info/index.php?RID=5&catdoc_idt=7. “EUMETSAT website. 13 Aug. 2009. http://www.eumetsat.int/. For details see Schmidt-Tedd, Bernhard and Isabelle Arnold. “The French Act Related to Space Activities. From International Law Idealism to National Industrial Pragmatism.” Aug. 2008. ESPI Perspectives 11. 7 Jan. 2010. http://www.espi.or.at/images/stories/dokumente/Perspectives/espi-perspectives_11.pdf. French Foreign Ministry website. 14 Aug. 2009. http://www.diplomatie.gouv.fr/fr/. “German Federal Minister of Economics Michael Glos and Bavarian Prime Minister Gunther Beckstein visit DLR in Oberpfaffenhofen.” 17 July 2008. DLR. 14 Aug. 2009. http://www.dlr.de/en/desktopdefault.aspx/tabid-3432/7418_read-13067/7418_page-5/. “Bundeswirtschaftsminister zu Guttenberg: «Raumfahrt-Robotik Bringt einen Technologieschub f€ur Deutschland».” 13 May 2009. Pressemitteilung Bundesministerium fur Wirtschaft und Techno-logie. 14 Aug. 2009. http://www.bmwi.de/BMWi/Navigation/Presse/pressemitteilungen,did=301028.html. “Inauguration of the Galileo Control Centre at DLR.” 8 Sept. 2008. DLR. 14 Aug. 2009. http://www.dlr.de/en/desktopdefault.aspx/tabid-3432/7418_read-13448/7418_page-4/. “Germany and China Step up Cooperation in Space.” 16 Dec. 2008. DLR. 14 Aug. 2009. http://www.dlr.de/en/desktopdefault.aspx/tabid-667/7411_read-14864/. “Italy Space Activities Year 2008.” ASI. 14 Aug. 2009. http://www.asi.it/files/COPUOS%20-%20Italian%20Space%20Activities%20Report%202008.pdf. ; “Gelmini: «Italy is a Leader Player in Space.»” 18 June 2009. ASI. 14 Aug. 2009. http://www.asi.it/en/news_en/gelmini_italy_is_a_leading_player_in_space. “Italy and Argentina Move Forward in Space Cooperation.” 22 Apr. 2009. ASI. 14 Aug. 2009. http://www.asi.it/en/news_en/italy_and_argentina_move_forward_in_space_cooperation__0. “Gelmini: «Italy is a Leader Player in Space».” 18 June 2009. ASI. 14 Aug. 2009. http://www.asi.it/en/news_en/gelmini_italy_is_a_leading_player_in_space. BNSC website. 14 Aug. 2009. http://www.bnsc.gov.uk/. “H.R. 1105: Omnibus Appropriations Act, 2009.” Govtrack.us. 17 Aug. 2009. http://www.govtrack.us/congress/bill.xpd?bill=h111-1105. Flightglobal.com. 23 Nov. 2009. http://www.flightglobal.com/articles/2009/05/07/326213/altair-and-ares-v-design-contracts-on-hold-till-third.html. NASA website. 17 Aug. 2009. http://www.nasa.gov/. “Space Operations. Joint Publication 3:14.” 6 Jan. 2009. Joint Chiefs of Staff. 17 Aug. 2009. http://www.dtic.mil/doctrine/jel/new_pubs/jp3_14.pdf. “Army Regulation 900-1.” 23 Jan. 2009. Department of the Army Space Policy. 17 Aug. 2009. http://www.fas.org/irp/doddir/army/ar900-1.pdf. Mathieu, Charlotte. “Assessing Russia’s Space Cooperation with China and India. Opportunities and Challenges for Europe.” 12 June 2008. ESPI Report 12. 17 Aug. 2009. http://www.espi.or.at/images/stories/dokumente/studies/espi%20final%20report%20ric.pdf. “Roscosmos Priorities.” 16 June 2009. Roscosmos. 17 Aug. 2009. http://www.roscosmos.ru/NewsDoSele.asp?NEWSID=6491. Glonass Information-Analytical Center website. 17 Aug. 2009. http://www.glonass-ianc.rsa.ru/pls/htmldb/f?p=202:1:1244260643211211752::NO. Russianspaceweb website. 17 Aug. 2009. http://www.russianspaceweb.com/ppts_lv.html. “Russia Set to Invest Heavily in Space Industry.” 22 Oct. 2008. New Scientist Space and Reuters. 18 Aug. 2009. http://www.newscientist.com/article/dn15014-russia-set-to-invest-heavily-in-space-industry.html. Russian space web website. 18 Aug. 2009. http://www.russianspaceweb.com/svobodny.html. JAXA website. 18 Aug. 2009. http://www.jaxa.jp/.166 Euroconsult. “ChangZhen 5 (Long March 5) Launch Vehicle.” 20 Feb. 2009. Sinodefence.com. 18 Aug. 2009. http://www.sinodefence.com/space/launcher/changzheng5.asp; “New Space Launch Center to Be Built in China’s Southernmost Hainan.” 3 Mar. 2009. Space Daily. 18 Aug. 2009. http://www.spacedaily.com/reports/New_Space_Launch_Center_To_Be_Built_In_China_Southernmost_Hainan_999.html. “China Able to Send Man to Moon Around 2020.” 12 Mar. 2009. Space Daily. 18 Aug. 2009. http://www.spacedaily.com/reports/China_Able_To_Send_Man_To_Moon_Around_2020_999.html. “India Launches Spy Satellite.” 20 Apr. 2009. Space War. 18 Aug. 2009. http://www.spacewar.com/reports/India_launches_spy_satellite_999.html. Shin, Jenny. “Chronology of North Korea’s Missile Flight Tests.” 13 July 2009. 21 Aug. 2009. http://www.cdi.org/pdfs/NKMissileTestTimeline7.16.09.pdf. Agbaje, Ganyi I. “Current Trends in Nigeria’s Space Development Programme to Facilitate Geospatial Information (GI) Sharing and Implementation of the NGDI.” 2008.18 Aug. 2009. http://www.state.gov/documents/organization/110820.pdf. ASAL (Agence Spatiale Algérienne) website. 18 Aug. 2009. http://www.asal-dz.org/. South African Space Portal. 18 Aug. 2009. http://www.space.gov.za/. “Super Science — Space and Astronomy.” 12 May 2009. Australian Government. Ministers for Innovation, Industry, Science and Research. 19 Aug. 2009. http://minister.innovation.gov.au/Carr/Pages/SUPERSCIENCESPACEANDASTRONOMY.aspx. 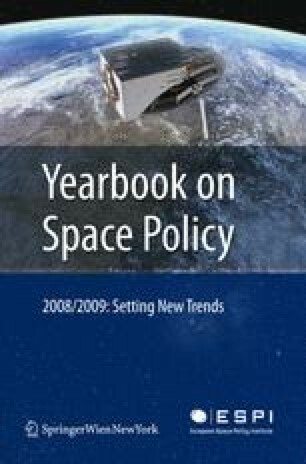 “Space Policies, Issues and Trends 2008/2009.” May 2009. ESPI. 16 Dec. 2009. http://www.espi.or.at/images/stories/dokumente/studies/espi%20report%2018.pdf. “Space Business Review.” Dec. 2008. Milbank. 8 Jan. 2010. http://www.milbank.com/NR/rdonlyres/B34A51C3-5450-463C-B8C1-008D261CD07A/0/December_2008_Space_Business_Review.pdf “Space Business Review.” Dec. 2009. Milbank. 8 Jan. 2010. http://www.milbank.com/NR/rdonlyres/4429D43E-4A1A-4F8C-B129-067607E6530A/0/December_2009_Space_Business_Review.pdf. de Selding, Peter B. “Swiss Firm Align Self for Role in Civil and Civil and Military Space.” Space News 21 July 2008: 6; Sherrer, Peter. “YIR: RUAG Aerospace.” Dec. 2008. SatMagazine. 8 Jan. 2010. http://www.satmagazine.com/cgi-bin/display_article.cgi?number=663514835&method=print#. “Oerlikon Verkauft Geschäaftsbereich Space an RUAG.” 2 June 2009. Common Press Release by Oerlikon and RUAG. 8 Jan. 2010. http://www.ruag.com/de/media_relations/Medienmitteilungen_PDF/Medienmitteilungen_PDF_2009/02.06.09_Oerlikon_RUAG_MediaRelease_de.pdf; “OC Oerlikon Verkauft Raumfahrtsparte an Ruag.” 2 June 2009. News.ch. 8 Jan. 2010. http://www.news.ch/OC+Oerlikon+verkauft+Raumfahrtsparte+an+Ruag/389059/detail.htm. “ELTA S.A. Acquires Maker of Ground Station Equipment.” Space News 4 Aug. 2008:9; “OHB Shareholding Elta S.A. Extends its Space Activities by Acquiring SMP S.A., Toulouse.” 28 July 2008. OHB Technology AG Press Release. 8 Jan. 2010. http://www.finanznachrichten.de/nachrichten-2008-07/11379387-press-release-ohb-technology-ag-ohb-shareholding-elta-s-a-extends-its-space-activities-by-acquiring-smp-s-a-toulouse-015.htm. “Finmeccanica Completes Acquisition of DRS Technologies for 5.2 billion U.S. dollars.” 22 Oct. 2008. Finmeccanica Press Release. 8 Jan. 2010. http://www.drs.com/MediaCenter/1022press.aspx. Lagorce, Aude. “Dassault Buys Alcatel-Lucent’s Thales Stake.” 19 Dec. 2008. Market Watch. 8 Jan. 2010. http://www.marketwatch.com/story/dassault-aviation-buys-alcatel-lucents-thales-stake; Tran, Pierre. “Dassault Buys $2.2B Stake in Thales.” 19 Dec. 2008. DefenseNexs. 8 Jan. 2010. http://www.defensenews.com/story.php?i=3871176. de Selding, Peter B. “European Union Approves Astrium’s Acquisition of SSTL.” Space News 5 Jan. 2009:13; de Selding, Peter B. “Acquisition by Astrium Seen Boosting SSTL’s Competitiveness.” Space News 19 Jan. 2009: 6; “Astrium Acquires Surrey Satellite Technology Limited.” 13 Jan. 2009. EADS Astrium Press Release. 8 Jan. 2010. http://www.astrium.eads.net/en/press-center/press-re-leases/2009/astrium-acquires-surrey-satellite-technology-limited?set_language=en. Solarismobile website. 8 Jan. 2010. www.solarismobile.com/about-us/. “Inmarsat Shareholder May Buy the Company.” Space News 14 July 2008:19; Rousseau, Claude. “MSS Industry Sees XM-Sirius Syndrome.” Space News 8 Sep. 2008:19; Peel, Lilly. “Harbinger Talks on Inmarsat Takeover Back On.” 26 July 2008. Times Online. 8 Jan. 2010. http://business.timesonline.co.uk/tol/business/industry_sectors/telecoms/article4402240.ece; Galani, Una. “Clear Hand.” 25 July 2008. Reuters Breakingviews. 8 Jan. 2010. http://www.breakingviews.com/2008/07/25/Harbinger-Inmarsat.aspx. “Space Business Review.” July 2008. Milbank. 8 Jan. 2010. http://www.milbank.com/NR/rdon-lyres/951D8C88-6390-4D08-B18B-829B0C78D7DC/0/July_2008_Space_Business_Review.pdf. “Abertis Telecom Raises Its Stake in Hispasat to 33.4%.” Space News 27 Oct. 2008: 3; “ Abertis Strengthens Hispasat Position.” 22 Oct. 2008. Satellite Today. 8 Jan. 2010. http://www.satellitetoday.com/enterprise/headlines/Abertis-Strengthens-Hispasat-Position_25075.html. de Selding, Peter B. “Swedish Space Corp. Pays Cash for Universal Space Network.” Space News 26 Jan. 2009:6; “Swedish Space Completes Acquisition of Universal Space Network.” 4 May 2009. Space Mart. 8 Jan. 2010. http://www.spacemart.com/reports/Swedish_Space_Completes_Acquisition_Of_Universal_Space_Network_999.html. MotoSAT website. 12 Nov. 2009. http://www.motosat.com/. “Comtech to Buy Radyne for $11.50/shr.” 12 May 2008. Reuters. 8 Jan. 2010. http://www.reuters.com/article/mergersNews/idUSBNG2464720080512; Shrivastava, Anshu. “Comtech to Acquire Radyne in an All-Cash Accretive Transation.” 12 May 2008. TMCnet.com. 8 Jan. 2010. http://voipservices.tmcnet.com/feature/articles/27728-comtech-acquire-radyne-an-all-cash-accretive-transaction.htm. “Globalstar Announces Annual and Fourth Quarter Results for 2008.” 31 Mar. 2009. Globe Newswire. 8 Jan. 2010. http://phx.corporate-ir.net/phoenix.zhtml?c=203507&p=irol-newsArticle&ID=1271841&highlight=. “New Round of Financing Sallies Forth For Space X.” 29 June 2009. Satnews.com. 8 Jan. 2010. http://www.satnews.com/cgi-bin/story.cgi?number=196942570. de Selding, Peter B. “Iridium Gets New Owner, Cash to Start Next Constellation.” Space News 29 Sept. 2008: 6; Wylie, Peter. “Iridium and GHL Acquisitions to Merge.” 23 Sept. 2008. Fierce Telecom. 8 Jan. 2010. http://www.fiercetelecom.com/story/iridium-and-ghl-acquisitions-merge/2008-09-23. “DBSD North America Files Pre-Negotiated Plan to Restructure Debt.” 18 May 2009. Space Mart 8 Jan. 2010. http://www.spacemart.com/reports/DBSD_North_America_Files_Pre_Negotiated_Plan_To_Restructure_Debt_999.html. “Duncan Hunter National Defense Authorization Act For Fiscal Year 2009.” 14 Oct. 2008. GPO 8 Jan. 2010. http://www.dod.mil/dodgc/olc/docs/2009NDAA_PL110-417.pdf. Coppinger, Rob. “Russian Space Industry Rises Again.” 1 Oct. 2007. Flightglobal. 8 Jan. 2010. http://www.flightglobal.com/articles/2007/10/01/217401/russian-space-industry-rises-again.html. “Russia Set to Invest Heavily in Space Industry.” 22 Oct. 2008. NewScientist Space. 8 Jan. 2010. http://www.newscientist.com/article/dn15014-russia-set-to-invest-heavily-in-space-industry.html?full=true&print=true. “Russia to Decide on State Space Corporation in 2009-Ivanov.” 21 Oct. 2008. RIANovosti. 8 Jan. 2010. http://en.rian.ru/russia/20081021/117856949.html. “Centers: Svobodny.” 31 Dec. 2009. Russianspaceweb.com. 11 Jan. 2010. http://russianspaceweb.com/svobodny.html. Hanawa, Yuji. “Japanese Aerospace Industries Requests to the Government.” 6 Oct. 2008. Presentation. JAXA 12 Jan. 2010. http://eeepitnl.tksc.jaxa.jp/en/event/MEWS/21th/data/1-6.pdf. Myoken, Yumiko. “The Bill of Basic Space Law.” Apr. 2008. Presentation. 12 Jan. 2010. http://ukinjapan.fco.gov.uk/resources/en/pdf/5606907/5633988/The_Bill_of_Basic_Space_Law.pdf. Tachikawa, Keiji. “2009: ANew Era for Japan’s Space Program.” JAXA. 12 Jan. 2010. http://www.jaxa.jp/article/interview/vol44/p3_e.html. JAXA website. 6 Aug. 2009. http://www.jaxa.jp/article/special/transportation/kouchiyama_e.html. “Long March 5 Will Have World’s Second Largest Carrying Capacity.” 4 Mar. 2009. Space Daily. 12 Jan. 2010. http://www.spacedaily.com/reports/Long_March_5_Will_Have_World_Second_Largest_Carrying_Capacity_999.html. “Commercial Space Transportation: 2008 Year in Review.” Jan. 2009. FAA. 12 Jan. 2010. http://www.faa.gov/about/office_org/headquarters_offices/ast/media/2008%20Year%20in%20Review.pdf. Foust, Jeff. “Satellites, Launches and the Recession.” 30 Mar. 2009. The Space Review. 12 Jan. 2010. http://www.thespacereview.com/article/1341/1. “Arianespace Signs Contract With Russian Space Agency for 10 Soyuz Launchers.” 20 Sept. 2008. Arianespace Press Release. 12 Jan. 2010. http://www.arianespace.com/news-press-release/2008/09-20-08-Soyuz-Launcher-Contract.asp. “Arianespace Orders 35 Ariane 5ECA Launchers From Astrium.” 2 Feb. 2009. Arianespace Press Release. 12 Jan. 2010. http://www.arianespace.com/news-press-release/2009/02-02-09-launcher-order-from-astrium.asp. “SIPRI Yearbook 2009. Armaments, Disarmament and International Security. Summary.” 2009. SIPRI. 3 Jan. 2010. http://www.sipri.org/yearbook/2009/files/SIPRIYB09summary.pdf. “Pléiades”. CNES. 12 Jan. 2010. http://www.cnes.fr/web/CNES-fr/3227-pleiades.php. Bundeswehr website. 12 Jan. 2010. http://www.bundeswehr.de/. Skynet 5 Presentation. Paradigm Services. 12 Jan. 2010. http://www.paradigmservices.com/our_services/skynet5. Cosmo-SkyMed website. 12 Jan. 2010. http://www.cosmo-skymed.it/en/index.htm. Paz Satellite Presentation. EADS Astrium. 12 Jan. 2010. http://www.astrium.eads.net/en/news/the-paz-satellite-a-defence-and-security-solution-provided-by-astrium-espana.html. Athena-Fidus Presentation. CNES. 12 Jan. 2010. http://www.cnes.fr/web/CNES-en/5912-athena-fidus.php. de Selding, Peter B. “Two Firms offer to Help Finance Italian Military Comsat.” SpaceNews.com. 12 Jan. 2010. http://www.space.com/spacenews/archive07/sicral_0702.html. “Space Ministers Highlight Contribution of Space to Leading Economic Recovery Through Innovation.” 29 May 2009. ESA. 4 Jan. 2010. http://www.esa.int/esaCP/SEM3VJ1OWUF_index_0.html. “Council Conclusions and Draft Code of Conduct for Outer Space Activities.” 17 Dec. 2008. EU Council General Secretariat. 12 Jan. 2010. http://register.consilium.europa.eu/pdf/en/08/st17/st17175.en08.pdf. “Conclusions of the Brussels European Council of 11 and 12 December 2008 on the European Security and Defence Policy.” EU Council. 12 Jan. 2010. http://www.consilium.europa.eu/uedocs/cms_data/docs/pressdata/en/esdp/104699.pdf. “Declaration on Strengthening Capabilities.” 11 Dec. 2008. EU Council. 12 Jan. 2010. http://www.consilium.europa.eu/uedocs/cms_data/docs/pressdata/en/esdp/104676.pdf. 281EUSC Presentation. EUSC website. 12 Jan. 2010. http://www.eusc.europa.eu/index.php?option=com_content&task=view2&Itemid=10. “Presidency Report on ESDP.” 9 Dec. 2008. EU Council. 12 Jan. 2010. http://register.consilium.europa.eu/pdf/en/08/st16/st16686.en08.pdf. “ Critical Technologies for European Strategic Non-Dependence.” 9 Sept. 2008. ESA Congrex. 12 Jan. 2010. http://www.congrex.nl/08C37/. “A Common Security and Defence Strategy for Europe-Reply to the Annual Report of the Council.” 2 Dec. 2008. WEU Assembly. 12 Jan. 2010. http://www.assembly-weu.org/en/documents/sessions_ordinaires/rpt/2008/2028.pdf. “Multinational Space-Based Imaging System (MUSIS): European Space Cooperation for Security and Defence.” 3 Dec. 2008. WEU Assembly. 12 Jan. 2010. http://www.assembly-weu.org/en/documents/sessions_ordinaires/rpt/2008/2025.pdf. “No Separate Command for AFCYBER.” 10 Oct. 2008. CDI Space Security Update #7.12 Jan. 2010. http://www.cdi.org/program/document.cfm?DocumentID=4396&StartRow=1&ListRows=10&appendURL=&Orderby=D.DateLastUpdated&ProgramID=68&from_page=index.cfm; “U.S. Seeking out Cyber Warriors”. Ibid. “Allard Commission Calls for Combining Black, White Space.” 5 Sept. 2008. CDI Space Security Update #6. 12 Jan. 2010. http://www.cdi.org/program/document.cfm?documentid=4367&programID=68&from_page=./friendlyversion/printversion.cfm. Schaerlaeckens, Leander. “Russian Budget Cuts Could Impact EU Defence Market.” 23 Feb. 2009. UPI. 12 Jan. 2010. http://www.upi.com/Security_Industry/2009/02/23/Russian-budget-cuts-could-impact-EU-defense-market/UPI-79231235426701/. “Russia to Build Space Defence System.” 27 Sept. 2008. DAWN. 12 Jan. 2010. http://www.dawn.com/2008/09/27/int6.htm. “Space-Related Defence Policies and Future Topics for Consideration.” Nov. 2008. Japanese Ministry of Defence. 12 Jan. 2010. http://www.mod.go.jp/e/d_policy/pdf/space2008.pdf. “Space Policy.” 28 Apr. 2009. APAN Executive Summary. 12 Jan. 2010. http://www1.apan-info.net/vic/Home/VICAdmin/ProductFullView/tabid/1755/ArticleID/11833/CBModuleId/5208/Default.aspx. “China military Space Projects.” Globalsecurity.org. 12 Jan. 2010. http://www.globalsecurity.org/space/world/china/military.htm. Gunter’s Space Page. 13 Jan. 2010. http://space.skyrocket.de/. Covault, Graig. “China Readies Military Space Station-Launch Coincides with Shuttle Phase-Out.” 2 Mar. 2009. Space Flight Now. 13 Jan. 2010. http://www.spaceflightnow.com/news/n0903/02chinastation/. Chen, Lan. “Is the Chinese manned Space Program aMilitary Program?” 30 Mar. 2009. The Space Review. 13 Jan. 2010. http://www.thespacereview.com/article/1340/1. “India to Boost Military Spending by 50%.” 11 June 2008. RIA Novosti. 13 Jan. 2010. http://en.rian.ru/world/20080611/110101921.html. “Indian Space Ambitions Soar With Lunar Launch.” 22 Oct. 2008. New Scientist. 13 Jan. 2010. http://www.newscientist.com/article/dn15008. “India to Scale-Up Military use of Space: Army Chief.” 17 June 2008. Thaindian News. 13 Jan. 2010. http://www.thaindian.com/newsportal/sci-tech/india-to-scale-up-military-use-of-space-army-chief_10060839.html. Rule, Christopher. “Wideband Global Satellite Communications System.” Australian Department of Defence Magazine. 13 Jan. 2010. http://www.defence.gov.au/defencemagazine/editions/200708_08/cdg_comms.pdf. Single, Thomas. “Considerations for a NATO Space Policy.” Sept. 2008. ESPI Perspectives 12. 14 Jan. 2010. http://www.espi.or.at/images/stories/dokumente/studies/espi_perspectives_12.pdf. “Al-Hiwar Satellite TV Off-Air After «Deliberate Jamming».” 8 May 2009. Radio Netherlands Worldwide. 13 Jan. 2010. http://blogs.rnw.nl/medianetwork/al-hiwar-satellite-tv-off-air-after-deliberate-jamming-paper. “Satellite Collision Leaves Significant Debris Clouds.” NASA Orbital Debris Quarterly News 13.2 Apr. 2009. 13 Jan. 2010. http://www.orbitaldebris.jsc.nasa.gov/newsletter/pdfs/ODQNv13i2.pdf:1-2. “Fengyun-1 C Debris.” NASA OrbitalDebris Quarterly News 13.1 Jan. 2009. 13 Jan. 2010. http://www.orbitaldebris.jsc.nasa.gov/newsletter/pdfs/ODQNv13i1.pdf:2.